The General Services Administration (GSA) reports that there was no truth to assertions that Clinton White House officials had vandalized the White House before departing in January 2001. Bush White House officials made those assertions in January (see January 25, 2001), claims which were picked up on and embellished by conservative talk radio hosts and other media reporters (see January 25-27, 2001 and January 26, 2001). The GSA investigated the claims at the request of House Representative Bob Barr (R-GA). Normal Wear and Tear, Pranks Found - The GSA report finds that nothing unusual had occurred during the transition from the Clinton administration to the Bush administration. “The condition of the real property was consistent with what we would expect to encounter when tenants vacate office space after an extended occupancy,” the GSA report finds. Although some pranks were found to have taken place—“W” keys removed from computer keyboards and signs reading “Office of Strategery” placed on office doors, for example—none of the other alleged actions took place. No Evidence for Allegations of Vandalism - No computers, copiers, or telephones were destroyed; no lewd graffiti or pornographic images were pasted to walls or displayed on computer monitors. Nothing was stolen either from the White House or from Air Force One, as many reports had insisted (see February 8, 2001 and February 14, 2001). 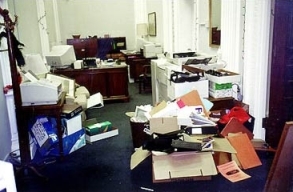 White House press secretary Ari Fleischer backs off of previous claims that Clinton administration officials vandalized the White House, and stole all manner of items, during the January 2001 transition between the Clinton and Bush administrations (see January 26, 2001). A General Services Administration report found the allegations virtually without merit (see May 18, 2001). Fleischer is asked about the report, and about his allegations that Bush officials had made a “catalogue” of the vandalism and theft that apparently does not exist. Fleischer now says that he had attempted to “knock… down” reports of alleged vandalism “and draw everybody back and away from this story because it was not something the White House was pursuing.” Fleischer continues: “And I indicated that there was no investigation going on, because there wasn’t. I said, if anything, somebody is cataloguing this. And the next day I further explained that meant that somebody was just keeping mental track of what was taking place. There were no written records about it all. But they were keeping on eye on and noting what did take place as this administration came into office.… The General Services Administration contacted the White House recently and asked if there were any written records of what took place. And just as I indicated, because there were no written records, the White House informed the General Services Administration that we had no written records to provide them. And I think that’s what their report indicated, the White House did not provide them any written records because there were none. Which is what I indicated at the time.” Fleischer says the White House intends “not to live in the past” and focus on “things that took place as this administration entered office…” [White House, 5/22/2001] Fleischer fails to acknowledge that it was his hints and innuendos to the White House press corps that encouraged the story to spread (see January 25, 2001). Anthony Weiner. [Source: Anthony Weiner]A Democratic House member and four former Clinton administration staff members demand an apology from President Bush over the disproven Clinton “vandal scandal” stories from January 2001 (see January 25, 2001 and January 26, 2001). Two weeks ago, the General Services Administration (GSA) released a report debunking the stories (see May 18, 2001). In response, the White House leaks a hastily compiled “list” of damages that Bush staffers allege was done during the transition period (see June 2-3, 2001). Bush officials release this photo as evidence of the ‘systematic vandalism’ performed by outgoing Clinton staffers in January 2001. [Source: White House / Salon]The White House releases a list of damages it says were done by Clinton staffers as part of the Clinton “vandal scandal,” allegations that the White House and Air Force One were vandalized and looted in the final days of the Clinton administration (see January 26, 2001). White House press secretary Ari Fleischer gives the list to Washington Post reporter Mike Allen, but no one else. Catalogue Based on Bush Staffers' Recollections - For months, White House officials have claimed they were keeping a “catalogue” detailing the damages done, but until now have failed to produce that catalogue; such a listing was not provided to the General Services Administration (GSA) when it reported that the stories of vandalism and looting were almost entirely false (see May 18, 2001). The General Accounting Office (GAO) reported in April that, partly because of the White House’s refusal to release its list of damages, it could confirm none of the often-sensational claims. According to Allen, the damages include “obscene graffiti in six offices, a 20-inch-wide presidential seal ripped off a wall, 10 sliced telephone lines, and 100 inoperable computer keyboards.” Also, pornographic or obscene phone messages were recorded on 15 telephone lines in various offices, requiring the answering machines to be reprogrammed; some printers had pornographic images inserted in stacks of blank copy paper. Doorknobs and nameplates are also listed as “missing.” Most of the alleged vandalism occurred, not in the White House, but in the Eisenhower Executive Office Building, adjacent to the White House. Fleischer says the catalogue was not prepared until Friday, and is based on what Allen calls “the recollections of officials and career government employees, in response to Democrats’ ‘suggestion that the Bush White House made things up’” (see June 1, 2001). The General Accounting Office (GAO) intends to reopen its investigation into the so-called Clinton “vandal scandal,” which alleged that Clinton aides had vandalized and looted both the White House and Air Force One in the final days of the Clinton administration (see January 26, 2001). The General Services Administration has recently found that reports of vandalism and theft are almost wholly false (see May 18, 2001). The GAO wants the list of damages that White House press secretary Ari Fleischer recently gave the Washington Post (see June 2-3, 2001), a list that for months White House officials insisted never existed. “We are going to proceed and do the review,” says Bernard Ungar, the GAO’s director of physical infrastructure. “Now they say there is a list.” In April, the GAO asked for the list, which Fleischer had said in January was being compiled (see January 25, 2001); at that time, White House officials admitted that such a list did not exist except in some officials’ “heads” (see April 18, 2001). White House spokeswoman Claire Buchan says that President Bush and others have been downplaying the “vandal scandal” issue because Bush wanted to “move forward”; however, she says, “when it became clear on Friday that others wanted to pursue this issue, the White House staff reconstructed orally what happened.” Buchan is referring to demands from Anthony Weiner (D-NY) that Bush apologize for smearing Clinton staffers’ reputations with the false allegations (see June 1, 2001). “Nothing has fundamentally changed about this story from the very beginning,” says former Clinton press secretary Jake Siewert. “The White House has been smearing a whole class of people without providing any evidence. Most of us are perfectly willing to accept the fact if it turns out to be that something happened. It’s just been these vague allegations without any proof. If there’s damage, there will be a record. If I wanted to get a phone fixed, there’s a paper trail.” Buchan blames White House service staff, who work at the site regardless of what administration is in office, for the original rumors. [Knight Ridder, 6/4/2001] A year later, the GAO will release a report finding “minor damages” occurred during the Clinton-Bush transition (see June 12, 2002).